Bedside ultrasonography is indicated in the presence of vaginal bleeding or abdominal pain in a patient in the first trimester of pregnancy. Do not perform bedside ultrasonography if it delays resuscitation or definitive surgical care in an unstable patient. Bedside ultrasonography is an important tool for emergency medicine clinicians and other acute care clinicians to use in assessing patients’ risk for potential ectopic pregnancy. Early diagnosis can be very valuable in lessening morbidity and mortality. Diagnosis before tubal rupture can prevent life-threatening hemorrhage and increase the probability that the patient may be managed medically or via tube-conserving surgery. However, use of ultrasonographic imaging should never preclude adequate resuscitation or definitive surgical therapy in a patient who is hemodynamically unstable and in whom ectopic pregnancy is strongly suspected. The goal of bedside ultrasonography is to diagnose an intrauterine pregnancy (IUP). Ectopic pregnancy can be reliably excluded in patients with a demonstrated IUP; heterotopic pregnancy remains very rare in patients who are not taking fertility agents. Heterotopic pregnancies occur in approximately 1 in 5,000 pregnancies, but the incidence increases to as high as 1 in 100 in women undergoing fertility stimulation or procedures. This limited diagnostic focus differs from that of the ultrasonography performed by the radiology department and has also been called point-of-care limited ultrasonography (PLUS). When the serum level of beta human chorionic gonadotropin (β-hCG) is higher than 1500 mIU/mL, the level known as the discriminatory zone, transvaginal ultrasonographic findings of an IUP should be present (see the image below). Transverse picture of intrauterine pregnancy. 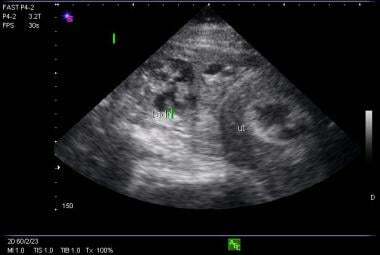 A conservative definition of a sonogram diagnostic for an IUP involves demonstration of a clearly defined yolk sac within the gestational sac (see the images below). Picture of gestational sac with yolk sac. Transverse picture of gestational sac with yolk sac. The yolk sac appears by 5-6 weeks’ gestation and should definitely be present when the MSD is greater than 8 mm. The embryo, or fetal pole, can be visualized on transvaginal ultrasonography by 6 weeks’ gestation and on transabdominal ultrasonography by 7 weeks’ gestation, and it should be present when the MSD exceeds 16 mm. Definitive ultrasonographic diagnosis of an ectopic pregnancy is made in only about 20% of cases, when an extrauterine pregnancy is clearly identified (ie, an extrauterine gestational sac with a yolk sac or fetal pole is visualized). There exist, however, numerous findings that are highly suggestive of ectopic pregnancy, including an empty uterus in a patient with a β-hCG level above the discriminatory zone, an adnexal mass other than a simple cyst (see the image below), echogenic fluid in the cul-de-sac, or anything more than a small amount of fluid in the cul-de-sac. 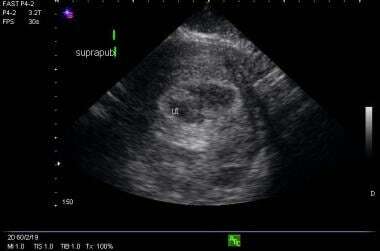 Picture of uterus without a fetal pole and a complex adnexal mass consistent with ectopic pregnancy. Patients who exhibit such findings should be managed in consultation with an obstetrician; they likely will need surgical exploration or medical therapy with methotrexate. Ultrasonographic findings that are neither diagnostic nor highly suggestive of an IUP or ectopic pregnancy are classified as indeterminate. These findings include an empty uterus, an abnormal gestational sac (eg, a sac with an irregular border or an MSD large enough that a secondary structure such as a yolk sac would be expected), a normal gestational sac without a yolk sac or embryo, a nonspecific intrauterine fluid collection, and ill-defined echogenic material within the endometrial cavity (see the image below). Patients who exhibit these findings are generally monitored closely with serial β-HCG testing and clinical assessments, as about 10-25% of such patients have normal pregnancies. Picture of abnormal endometrium in a patient with an ectopic pregnancy. Anesthesia is generally not necessary for sonographic evaluation. However, patients may experience discomfort from the pressure of the transducer. Lubricating jelly - Because acoustic gel causes an intravaginal dermatitis, the lubricating jelly Surgilube should be used on the outside of the transducer cover. The patient should be in a hospital gown, undressed from the waist down. For transabdominal ultrasonography, position the patient in the supine recumbent position. For transvaginal ultrasonography, position the patient in the supine lithotomy position. Be sure to scan systematically and widely, including the entire uterus and cervix in the transverse and sagittal planes. Failure to scan through the entire uterus, cervix, and adnexa can lead to missed ectopic pregnancies. Explain the procedure, benefits, risks, and complications to the patient or the patient’s representative. Ask the patient or the patient’s representative if he or she would like others to be present for the procedure. The primary role of emergency department (ED) obstetric ultrasonography is to demonstrate an intrauterine pregnancy (IUP). When the beta human chorionic gonadotropin (β-hCG) level is greater than 1500 mIU/mL, transvaginal ultrasonographic evidence of an IUP should exist. The first visible structure is the gestational sac. Subsequent yolk sac, embryo, and fetal cardiac activity should appear at predictable time intervals and mean sac diameter sizes. 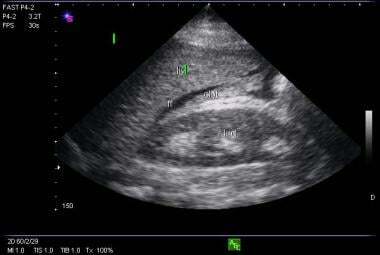 Transabdominal ultrasonography is best performed on a patient who has a full bladder. Expose the abdomen from xiphoid to pubis. Apply a generous amount of acoustic gel to the patient’s lower abdomen, the abdominal transducer, or both. The uterus is a muscular hollow organ behind the bladder and anterior to the colon, with a moderately echogenic, homogenous myometrium and a relatively hyperechoic endometrium. First, scan the uterus in the transverse plane. Hold the probe perpendicular to the patient’s long axis, with the indicator of the probe pointing toward the patient’s right, and sweep from fundus to cervix (see the image below). Transverse probe placement for transabdominal obstetric examination. Next, scan the uterus in the sagittal plane. Hold the probe parallel to the patient’s long axis, with the indicator of the probe pointing toward the patient’s head, and sweep from side to side (see the images below). Be sure to identify the landmarks: the bladder, the vaginal stripe, and the uterus. Sagittal or longitudinal probe placement for transabdominal obstetric examination. Sagittal viewing showing bladder, uterus (behind the bladder), and endometrial stripe (within the uterus). Free fluid in the Morison pouch from a ruptured ectopic pregnancy. Transvaginal ultrasonography is best performed on a patient who has an empty bladder. The cul-de-sac is formed by the peritoneal reflection anterior and posterior to the uterus. A small amount of anechoic fluid in the cul-de-sac is physiologic. 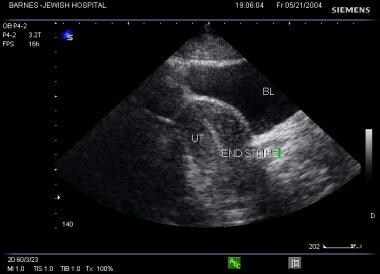 Echogenic fluid in the cul-de-sac is highly suggestive of a ruptured ectopic pregnancy. Upon visualization of a round anechoic structure in the endometrial cavity that is consistent with a gestational sac, acquire pictures and measure the length, height, and width of the gestational sac to obtain the mean sac diameter (MSD). These measurements are taken from the inner aspects of the echogenic border of the sac. Visualization of a double decidual ring (ie, 2 echogenic rings around the gestational sac) is pathognomonic for an early IUP. In radiology literature, this is considered the earliest reliable sign of an IUP. Double decidual signs, however, are not consistently seen, and caution should be used in terms of using them to determine the presence or absence of an IUP. 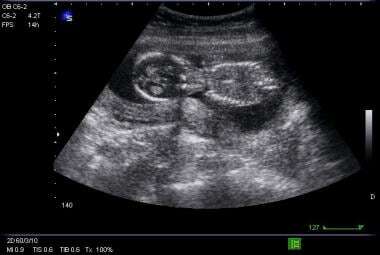 Prior to this stage, demonstration of a simple gestational sac is an indeterminate ultrasonographic finding. The yolk sac is a round echogenic ring with an anechoic center located within the gestational sac. 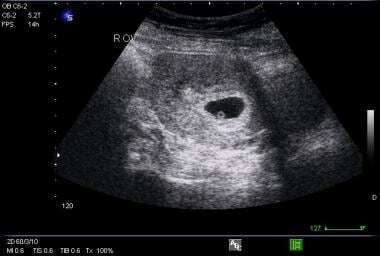 The yolk sac can generally be used to determine the presence or absence of an IUP. The embryo is measured using crown-rump length, which is measured end-to-end (not including the yolk sac). 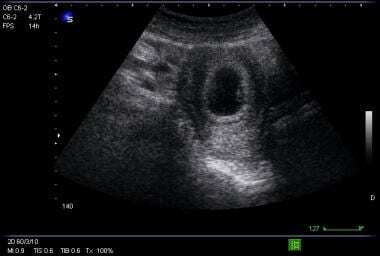 An extraovarian adnexal echogenic ring (tubal ring sign), highly suggestive of an ectopic pregnancy, occurs when the fallopian tube develops a trophoblastic reaction to an ectopic gestational sac. Interstitial ectopic pregnancy is rare but has a higher mortality rate following rupture, as the area is richly vascular. An eccentrically located gestational sac with a thin or incomplete myometrial mantle around the sac is suggestive of an interstitial gestation; this is the interstitial line sign. No major complications exist with the performance of emergency department (ED) ultrasonography to evaluate first-trimester pregnancy. Complications can ensue if an obstetrician is not consulted early in the treatment of a patient with early pregnancy and hemodynamic instability, acute abdomen, or falling hematocrit level. American College of Obstetricians and Gynecologists (ACOG). ACOG Practice Bulletin No. 101: Ultrasonography in pregnancy. Obstet Gynecol. 2009 Feb. 113(2 Pt 1):451-61. [Medline]. Centers for Disease Control and Prevention (CDC). Ectopic pregnancy--United States, 1990-1992. MMWR Morb Mortal Wkly Rep. 1995 Jan 27. 44 (3):46-8. [Medline]. Kirk E. Ultrasound in the diagnosis of ectopic pregnancy. Clin Obstet Gynecol. 2012 Jun. 55 (2):395-401. [Medline]. Casikar I, Reid S, Condous G. Ectopic pregnancy: Ultrasound diagnosis in modern management. Clin Obstet Gynecol. 2012 Jun. 55 (2):402-9. [Medline]. [Guideline] National Collaborating Centre for Women's and Children's Health (UK). Ectopic Pregnancy and Miscarriage: Diagnosis and Initial Management in Early Pregnancy of Ectopic Pregnancy and Miscarriage. RCOG. 2012 Dec. [Medline]. [Full Text]. Kaplan BC, Dart RG, Moskos M, et al. Ectopic pregnancy: prospective study with improved diagnostic accuracy. Ann Emerg Med. 1996 Jul. 28(1):10-7. [Medline]. Dart RG, Kaplan B, Varaklis K. Predictive value of history and physical examination in patients with suspected ectopic pregnancy. Ann Emerg Med. 1999 Mar. 33 (3):283-90. [Medline]. Ayim F, Tapp S, Guha S, Ameye L, Al-Memar M, Sayasneh A, et al. Can risk factors, clinical history and symptoms be used to predict risk of ectopic pregnancy in women attending an early pregnancy assessment unit?. Ultrasound Obstet Gynecol. 2016 Nov. 48 (5):656-662. [Medline]. Shih CH. Effect of emergency physician-performed pelvic sonography on length of stay in the emergency department. Ann Emerg Med. 1997 Mar. 29(3):348-51; discussion 352. [Medline]. Mateer JR, Valley VT, Aiman EJ, Phelan MB, Thoma ME, Kefer MP. Outcome analysis of a protocol including bedside endovaginal sonography in patients at risk for ectopic pregnancy. Ann Emerg Med. 1996 Mar. 27(3):283-9. [Medline]. Durston WE, Carl ML, Guerra W, Eaton A, Ackerson LM. Ultrasound availability in the evaluation of ectopic pregnancy in the ED: comparison of quality and cost-effectiveness with different approaches. Am J Emerg Med. 2000 Jul. 18(4):408-17. [Medline]. Kirk E, Bottomley C, Bourne T. Diagnosing ectopic pregnancy and current concepts in the management of pregnancy of unknown location. Hum Reprod Update. 2013 Oct 6. [Medline]. Abera A, Assefa G. Diagnostic performance of transvesical ultrasound in clinically suspected ectopic pregnancy in a public and tertiary hospital setup. Ethiop Med J. 2013 Jan. 51(1):49-57. [Medline]. Mathlouthi N, Slimani O, Fatnassi A, Ben Temime R, Makhlouf T, Attia L, et al. Ultrasound diagnosis of ectopic pregnancy : Prospective study about 200 cases. Tunis Med. 2013 Apr. 91(4):254-7. [Medline]. Mausner Geffen E, Slywotzky C, Bennett G. Pitfalls and tips in the diagnosis of ectopic pregnancy. Abdom Radiol (NY). 2017 May. 42 (5):1524-1542. [Medline]. Stein JC, Wang R, Adler N, Boscardin J, Jacoby VL, Won G, et al. Emergency physician ultrasonography for evaluating patients at risk for ectopic pregnancy: a meta-analysis. Ann Emerg Med. 2010 Dec. 56(6):674-83. [Medline]. Young L, Barnard C, Lewis E, Jones M, Furlan J, Karatasiou A, et al. The diagnostic performance of ultrasound in the detection of ectopic pregnancy. N Z Med J. 2017 Mar 24. 130 (1452):17-22. [Medline]. Richardson A, Gallos I, Dobson S, Campbell BK, Coomarasamy A, Raine-Fenning N. Accuracy of first trimester ultrasound features for diagnosis of tubal ectopic pregnancy in the absence of an obvious extra-uterine embryo: A systematic review and meta-analysis. Ultrasound Obstet Gynecol. 2015 Mar 12. [Medline]. Yadav P, Singla A, Sidana A, Suneja A, Vaid NB. Evaluation of sonographic endometrial patterns and endometrial thickness as predictors of ectopic pregnancy. Int J Gynaecol Obstet. 2017 Jan. 136 (1):70-75. [Medline]. Oh JS, Wright G, Coulam CB. Gestational sac diameter in very early pregnancy as a predictor of fetal outcome. Ultrasound Obstet Gynecol. 2002 Sep. 20 (3):267-9. [Medline]. Rodgers SK, Chang C, DeBardeleben JT, Horrow MM. Normal and Abnormal US Findings in Early First-Trimester Pregnancy: Review of the Society of Radiologists in Ultrasound 2012 Consensus Panel Recommendations. Radiographics. 2015 Nov-Dec. 35 (7):2135-48. [Medline]. Dighe M, Cuevas C, Moshiri M, Dubinsky T, Dogra VS. Sonography in first trimester bleeding. J Clin Ultrasound. 2008 Jul-Aug. 36(6):352-66. [Medline]. Bhatt S, Ghazale H, Dogra VS. Sonographic evaluation of ectopic pregnancy. Radiol Clin North Am. 2007 May. 45(3):549-60, ix. [Medline]. Dart R, McLean SA, Dart L. Isolated fluid in the cul-de-sac: how well does it predict ectopic pregnancy?. Am J Emerg Med. 2002 Jan. 20(1):1-4. [Medline]. Rodgerson JD, Heegaard WG, Plummer D, Hicks J, Clinton J, Sterner S. Emergency department right upper quadrant ultrasound is associated with a reduced time to diagnosis and treatment of ruptured ectopic pregnancies. Acad Emerg Med. 2001 Apr. 8(4):331-6. [Medline]. Dogra V, Paspulati RM, Bhatt S. First trimester bleeding evaluation. Ultrasound Q. 2005 Jun. 21(2):69-85; quiz 149-50, 153-4. [Medline]. Brown TW, McCarthy ML, Kelen GD, Levy F. An epidemiologic study of closed emergency department malpractice claims in a national database of physician malpractice insurers. Acad Emerg Med. 2010 May. 17 (5):553-60. [Medline]. Disclosure: Received salary from 3rd Rock Ultrasound, LLC for speaking and teaching; Received consulting fee from Schlesinger Associates for consulting; Received consulting fee from Philips Ultrasound for consulting. Fast Five Quiz: Can You Diagnose the Different Types of Spinal Muscular Atrophy?